Had the pleasure of sitting next to the Michigan legend in the pressbox a couple years ago. So fun to overhear some of the comments and stories. But when the game was going on, he was always very into watching what was happening on the field – all business. Should also note that Chappuis was born and raised in Toledo, OH, my hometown. Not just mine, but my dad's and also my grandfather's, who was a childhood friend and classmate of Chap growing up. Fellas like this don't come along very often, especially these days. He will be missed. 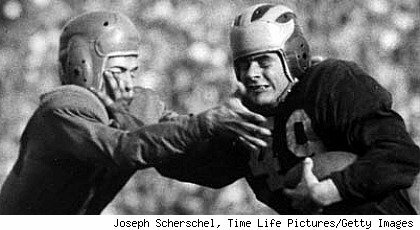 ANN ARBOR, Mich. – Former University of Michigan football All-American Bob Chappuis passed away late yesterday (June 14) at the age of 89. Chappuis was hospitalized after a fall earlier this week and died at the U-M Hospital surrounded by his wife, Ann, and their four children. Chappuis was elected to the College Football Hall of Fame in 1988 and was inducted into the Michigan Hall of Honor in 1984. Not only did Chappuis play football, he was a two-year letterman in baseball for the Wolverines. Chappuis played football for the Wolverines in 1942 before his career was interrupted by World War II. As an aerial gunner and radio operator on B-25 bombers during the war, Chappuis was shot down over Italy on his 21st mission. He was rescued by an Italian partisan and remained in Italy until the end of the war, evading German soldiers in a series of thrilling adventures. A triple-threat back, he resumed his Michigan playing career after the war in 1946. Chappuis became one of the greatest backs in college football during the 1947 season. He earned unanimous first-team All-America honors and finished second in the Heisman Trophy balloting. Chappuis led the 1947 Michigan squad, known as the “Mad Magicians,” to an undefeated season and the national title. Chappuis ended his Michigan football career as the 1948 Rose Bowl MVP, setting two records for total offense and pass completions in a 49-0 victory over Southern California. Chappuis was inducted into the Rose Bowl Hall of Fame in 1992. He continues to hold the Big Ten Conference single-season passer rating record (175.3 rating) and the U-M season mark for yards per completion (18.8 avg.). Chappuis led the Wolverines in passing and total offense in 1946 and 1947, receiving All-Big Ten honors both seasons. He was regarded as one of the early passing specialists in college football. He played two years of professional football with the All-America Football Conference (AAFC). Chappuis was the starting quarterback for the Brooklyn Dodgers and Chicago Hornets in 1948 and 1949. He retired from football in 1950 when the league folded. Chappuis entered the business sector and was a successful labor relations director. He was to be inducted into the state of Michigan Sports Hall of Fame this fall.